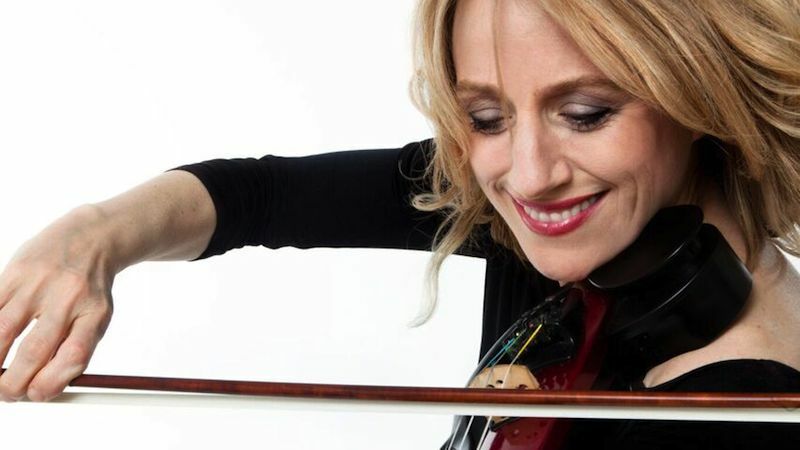 February 1, 2017, 8:21 PM · Violinist Daisy Jopling had a major cultural awakening at age 11, the day John Lennon was shot. Brought up on classical music in the countryside outside London, "I didn't know who he was!" she told me last month in a phone interview from New York, where she now lives. The idea that she was out of the loop, when it came to something as ubiquitous as the Beatles, was a wakeup call. It was one of the many things that propelled her to get out in the world and explore, to push the boundaries of what is expected of a classically-trained violinist. As she widened her horizons, she also has made a name for herself recording Hans Zimmer film scores with the group Triology, touring with her own Daisy Jopling Band and creating big productions that feature young students playing alongside pros. On Friday she releases her album, Awakening on Fleurs de Son Classics, her first recording of original compositions, grounded in her love for spirituals, pop, reggae, funk, Irish folk, gypsy tunes, classical, Argentine tango and more. On the album she collaborates not only with professional musicians, but for several songs, she's used a chorus from Hendrick Hudson High School in Montrose, New York (the "Treble Makers"!). That partnership stemmed from a larger music education effort that Jopling has taken on with great zeal, writing music and developing an original show, The String Pulse Experience, which allows young musicians to play alongside her own band. How did she get to this point? It was a long road. It all started around the time she graduated from London's Royal College of Music and realized that her musical education had left out one skill that she desperately wanted: the ability to improvise. She was determined to learn how. "I actually found an extra course at the Guildhall School of Music, a course specifically for musicians who wanted to start to improvise," Jopling said. She was only violinist in the room, and she found it to be tremendously challenging. "They gave us exercises like: create a story in your mind and try to express the emotions of the story. Or, create a solo using only two notes." "When I first started to improvise, it sounded very classical, like all the things I was used to playing," she said. "I needed learn how to feel free enough to express an emotion, but also I needed to literally build the physical patterns. That's what improvisers practice. I might think of something, but I couldn't do it, straightaway. I was used to learning something completely from music. So it was training those synapses, to be able to hear something in my mind and then play it." "It was like learning a new language, a new vocabulary of different motifs or lines -- musical licks," she said. Upon completing the course, she decided to do something radical to shake things up: she went for two and a half months to West Africa, to study with drumming master Mustapha Tettey Addy in Ghana. "He's an extraordinary musician, an amazing person, one of those people who you feel is the village shaman," Jopling said. His school, the Academy of African Music and Arts, is right outside of Accra, the capitol of Ghana. "So there I was, learning drumming, just to be able to get that feeling of repeating a rhythm and therefore creating a groove. That was very difficult for me at the beginning, to feel what it's like to get into the rhythmic patterns of playing music other than classical." "I was already in my 20s, so it was a process of breaking down a lot of the beliefs that I'd created about what I could or couldn't do, which took years and years," she said. Eventually she found herself in Vienna, working with several chamber groups, including Triology. She started writing her own music, but she found herself bumping up against tradition -- the German school of composition in which strict rules govern harmony and counterpoint. "I tried to learn these rules, but I didn't always want to follow them," she said. "So in Vienna I was also up against this idea that 'You're not following the rules!'" After about 12 years, she decided again on a radical change: she moved to New York. She found the atmosphere for music composition completely different; "The attitude was, 'Do your thing!'" Many people in New York have no grounding in classical music, and virtually no one was about to criticize her counterpoint. "I was suddenly surrounded by a kind of freedom from the mold that I was trying to break out of. It really helped me decide: I'm going to do my own thing!" Total freedom also has its challenges; what to do, when the options are endless? It took a while for her to settle into what she wanted. One idea was to add beats to classical music. "A lot of people loved it," she said, "but for me, it still wasn't getting what I wanted to do." Then a move to the country gave her some unexpected opportunities. She was living in New York City when she met her husband, who lived an hour north in a town called Peekskill, population 30,000. He was adamant that she come live with him there. "So I've moved up here, and I've been here for six years," she said. "It's changed my life in an amazing way." It all started when someone suggested that her band, which plays an eclectic mix of classical, pop, reggae, Irish folk, gypsy violin and rock, perform in the local 1,100-seat theater, the Paramount-Hudson Valley. "It's an absolutely gorgeous theater," she said. Still ensconced in her city life and touring, she had not really gotten to know anyone in the town. "Suddenly, I had a concert with my band, in an 1,100-seat theater, and nobody knew me and I didn't know anybody -- and nobody was going to come!" "Well, I had to quickly change this," she said. "I did two things: I offered to play anywhere and everywhere: parties, the local Chamber of Commerce, a restaurant -- I played all over town, any place I could! As I was doing this, I met all kinds of people." She also got to know the local music teachers. 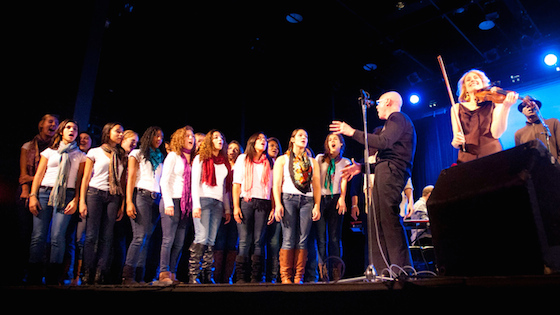 "I heard about a choir in one of the local high schools; a woman said, 'They could sing with your band!'" "I was a little bit skeptical," she said, "I thought, 'I'll definitely have to go and listen to them!'" "I went to one of their rehearsals, and these kids were mind-blowingly good -- it was perfect, it was beautiful," she said. "So I said to them, 'Do you want to be in my show?' And they were really excited, it's a nice theater to perform in. So we involved them." "Then I heard in the same way about a local dance group..." and it all grew from there. "We probably had about 60 kids taking part in the show. People were having the time of their life. The parents came to see their kids." That concert marked the start of a new chapter for Jopling. "Something happened -- the kids, their teachers, they said to me, 'This concert changed my life.' It's been five years, and I still meet kids who were in that concert, who tell me they'll never forget it and it was the best day of my life," Jopling said. "It gave them a certain kind of confidence. All they'd ever done was to perform for their school or their parents, and suddenly they were on the stage. I'd created a lighting design, I'd created a projections -- a professional show. For me, it was something very rewarding and beautiful: having these very highly-trained kids on stage and feeling their excitement." "I've done it every year at my local theater," she said. "At one point I had 200 kids on stage! It was pretty amazing." "That, in fact, was the catalyst to me writing music," Jopling said. A local string teacher suggested that she create a show that would bring together kids from all the school string programs. The extra challenge was to create something that allowed kids of varying abilities to participate. "I thought, I'm going to write the music for them," she said. "The music in this Awakening album, started with me writing for those kids." In 2014 she debuted an original show, something called The String Pulse Experience, which involved her own band as well as a larger side-by-side orchestra, comprised of professional musicians hired not only to play, but also the mentor the students. "This orchestra sounded like a top professional orchestra, even though it was half students. We created something really magical, really amazing." She has carried that shows to other communities, and her big dream now is to create a show with 1,000 students' voices, at Madison Square Garden. When it comes to the hall in Peekskill, nowadays they have no trouble selling it out -- it's a community event that brings people together to celebrate the accomplishments of music students and teachers and to raise money for music education. "It fits in with what so many of us are trying to do, which is to bring classical music to more people and to bring music to young people," Jopling said. She makes sure there are at least a few hundred tickets set aside so that local music students can see the show for free. "I want them to see: this is what we can do, if we carry on doing our music!" February 6, 2017 at 05:42 PM · I saw Daisy Jopling's, musical spectacular, Awakenings, it was Amazing! Daisy is a violin treasure with energy that masters all musical genres, classical to Rock on the violin like an Edith Piaf, inspiring and thrilling her audience..